At this time of year, I’m always asked the best way to cook up the main attraction at the Thanksgiving table. People automatically think that frying is off limits for healthy eating. Frying CORRECTLY in Peanut Oil and Brining makes your Turkey Taste Great AND Be Better-for-YOU. 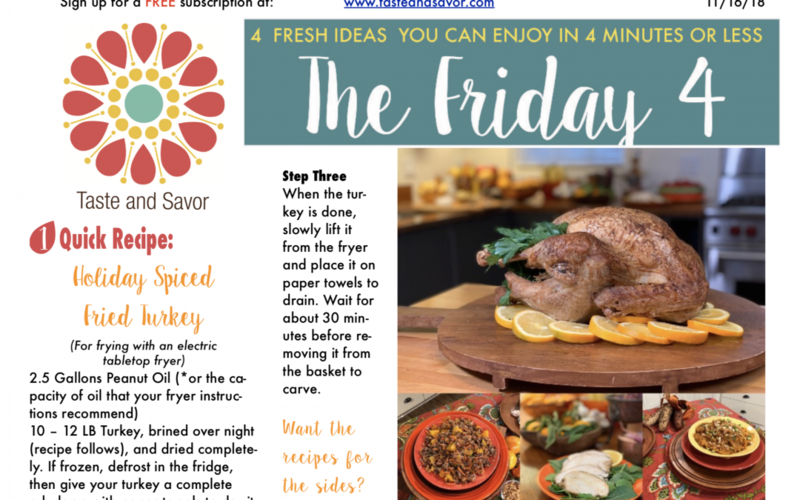 We accompanied our turkey with two easy and quick sides that will make your Thanksgiving Day Turkey shine. I love using an electric tabletop fryer and peanut oil for an easy and delicious Thanksgiving bird! It frees up valuable oven space and time for sides, dressing, casseroles, and pies (hallelujah!). And just look at the turkey – it has it a beautiful golden color and it tastes incredibly tender and juicy! First things first! Before you start, make sure you read and understand the manual that comes with your fryer. I’m giving you general directions below, based on the fryer I used. Even though your fryer can handle an 18 LB bird, I prefer smaller ones. If you need more that a 12 LB bird to find your family and friends, fry two. Since it only takes about an hour, once your fryer is up to temp, just pop a second bird in the hot oil. 10 – 12 LB Turkey, brined over night (recipe follows), and dried completely. If frozen, defrost in the fridge, then give your turkey a complete rub-down with paper towels to dry it completely. Double and triple check the bird to make sure there is no ice hidden in the cavity. Preheat the oil to 375F. Spray the basket with peanut oil and carefully place your dried turkey in the basket. SLOWLY lower the turkey in the oil. When the fryer comes back up to temperature, (you are putting a cold, heavy bird in the hot oil), Cook for about 3 to 4 minutes per LB of turkey. An instant read thermometer is your friend – dark meat should read 175F when inserted into the thigh and white meat should be 165F. 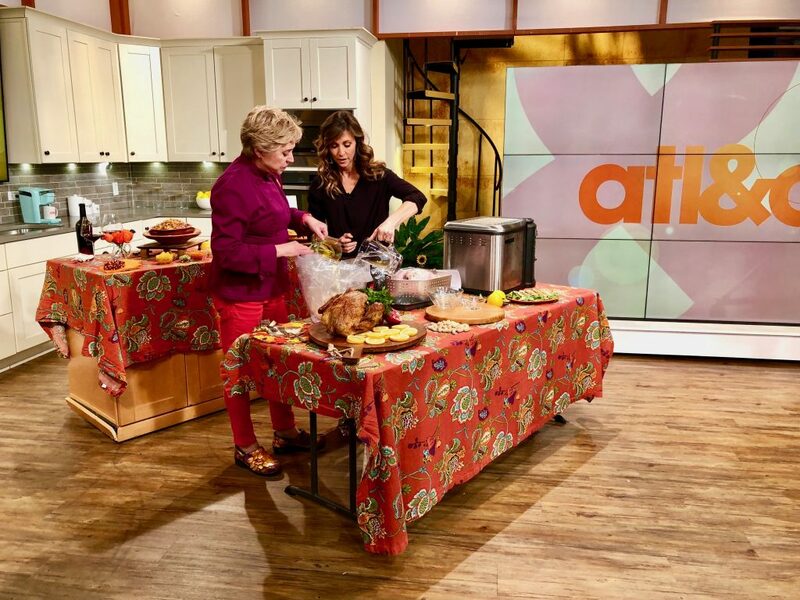 When the turkey is done, slowly lift it from the fryer and place it on paper towels to drain. Wait for about 30 minutes before removing it from the basket to carve. 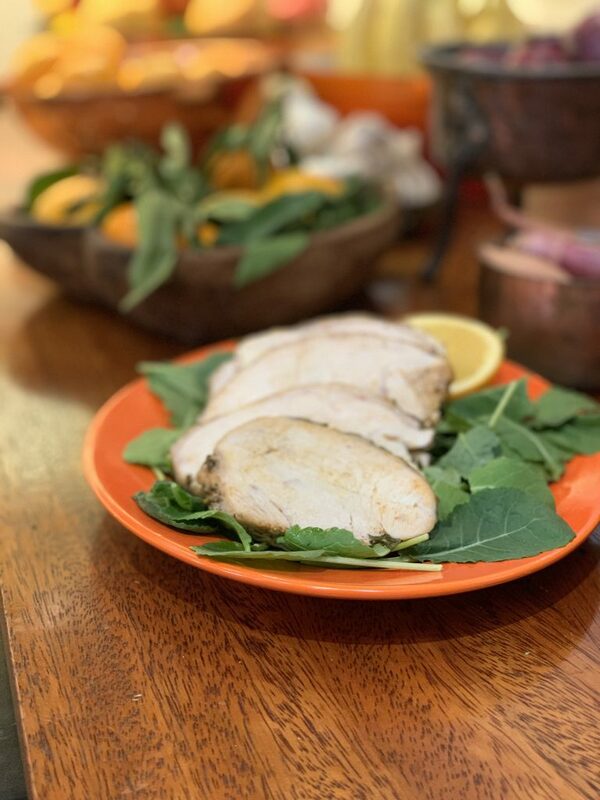 I recommend brining the bird – here’s my easy recipe for a turkey that is super flavorful and delicious! Bring the cider, garlic, ginger, cinnamon, peppercorns, oranges and salt to a boil in a very large (16-qt.) pot, stirring to dissolve salt. Let cool to room temperature. Stir in 1 1/2 gallons cold water. Submerge the turkey in the brine and place in the fridge overnight. 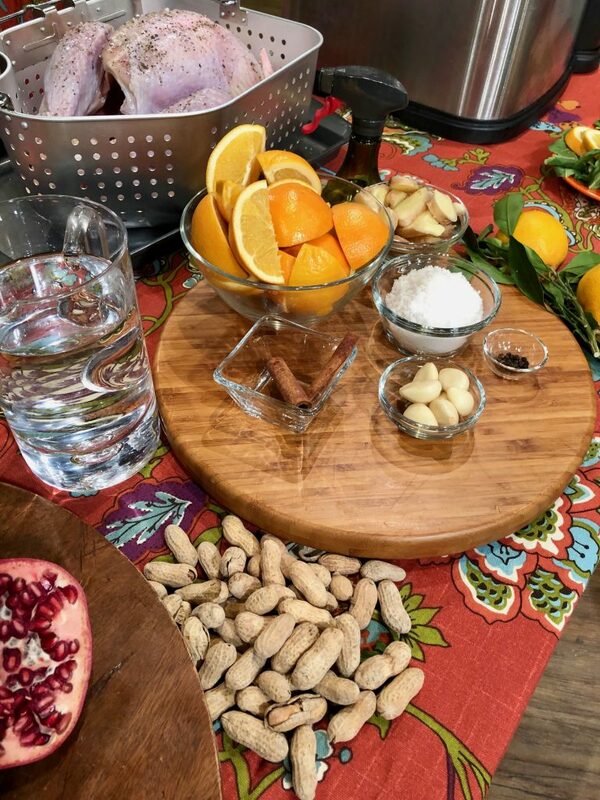 Remove the turkey from brine and pat COMPLETELY dry with paper towels; discard the brine. Season the turkey with salt and pepper, inside and out with salt and pepper. Now for some easy and luscious sides for your turkey. 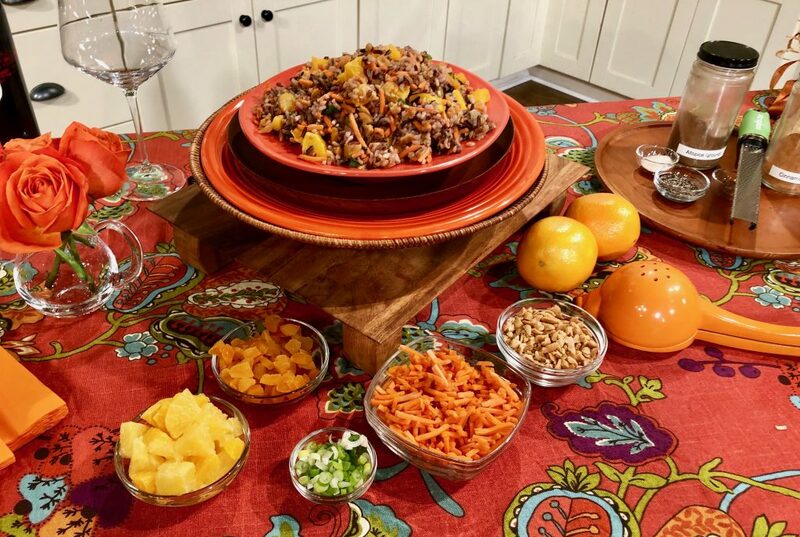 When creating these recipes, I used some of the same ingredients as the turkey – we’re layering on the fresh citrus flavors in both the Spiced Sweet Potato Mash and the Orange and Apricot Wild Rice. A change from traditional dressing or stuffing – the wild rice is both tangy and refreshing next to all the big flavors of Thanksgiving. Preheat the oven to 400F. 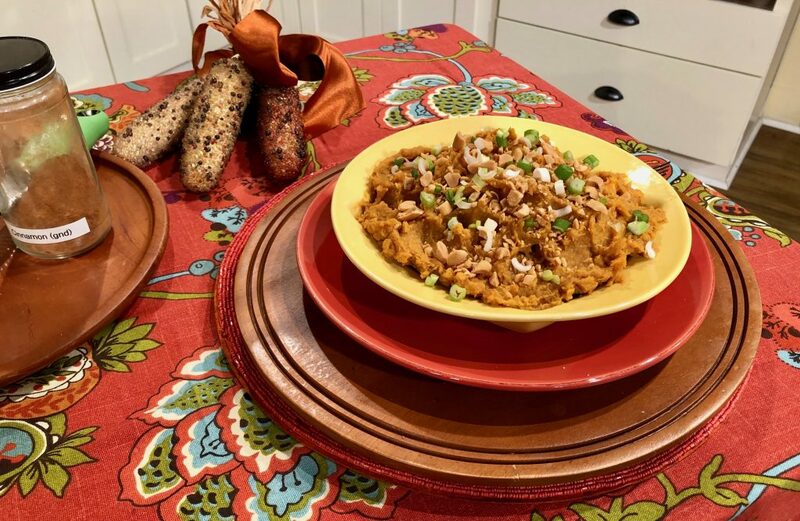 Using a fork, pierce sweet potatoes in several places and place in the microwave for about 7 – 10 minutes or until fork tender, set aside to cool. When potatoes are cool enough to handle, cut potatoes in half. Scoop pulp into large bowl. Add honey, butter, orange juice, orange zest, cinnamon, allspice, and nutmeg, season with salt and pepper. Using an immersion blender, puree until smooth. Cook the wild rice mix as the package directs. While the wild rice is cooking, make the dressing. Mash the garlic together with the salt to make a paste. Add the garlic paste along with the remaining ingredients to a jar and shake. Season to taste with salt and pepper. When the rice is tender, add the carrots, peanuts, oranges, apricots and green onions, toss gently. Drizzle in the dressing, a little at a time and toss the salad. Season to taste with salt and pepper. An American holiday needs an American wine! A lighter Zinfandel from Lodi California is a wonderful pair for the beautifully fried turkey and sides. 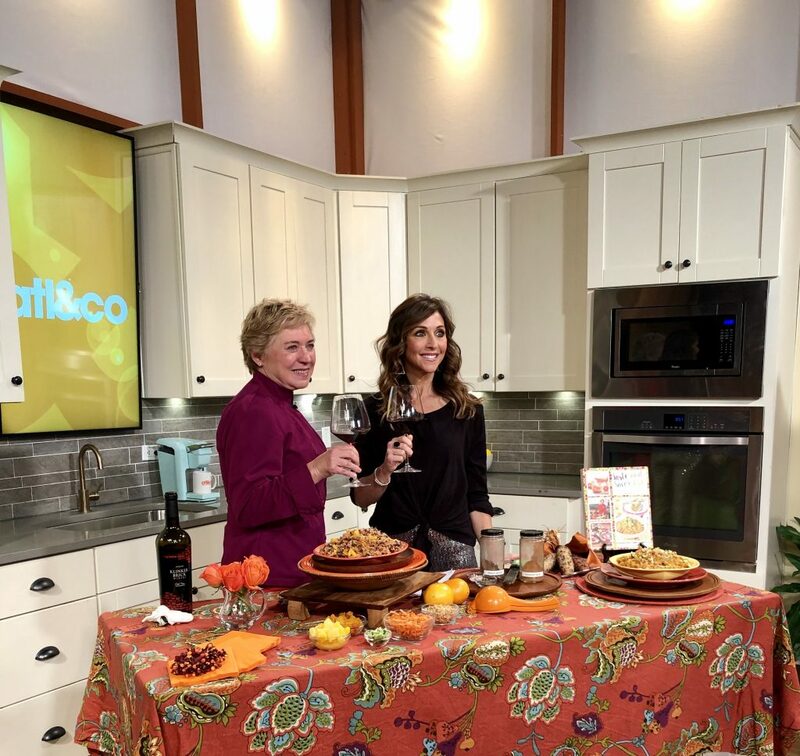 A red wine, the name of the wine and the grape are the same, and its cherry-berry-spicy notes will be a great accompaniment to spicy flavors in the turkey and sides.